Regency at Dominion Valley in Haymarket, VA enjoys a prime location in the heart of Virginia's Prince William County 35 miles west of Washington D.C. This upscale, gated golf community features resort-style living at its finest and welcomes active adults who are aged 55 or better. With beautiful attached and detached homes, a spacious clubhouse, plentiful amenities, various social groups, and a diverse setting, there truly is something to please every resident. 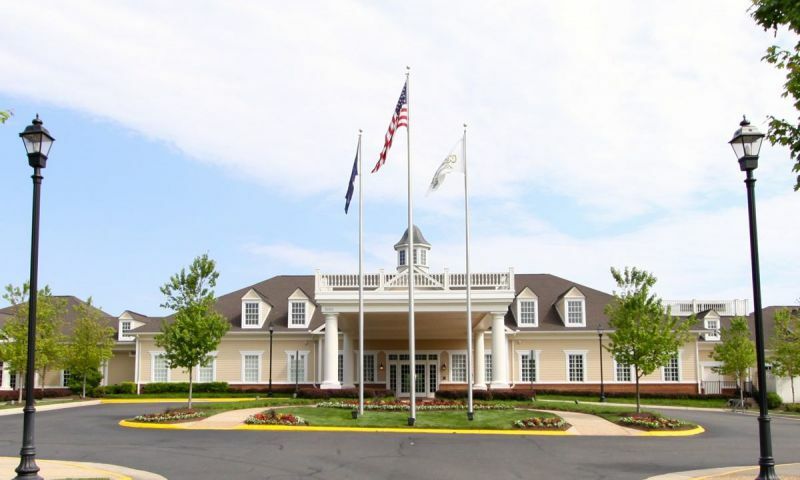 The Regency at Dominion Valley's 30,000 square-foot clubhouse contains all of the features active adults come to expect in an upscale, golf course community. Residents can easily stay in shape by visiting the large, state-of-the-art fitness center, which features cardiovascular and strength training equipment, an aerobics studio, spinning class, and yoga room. The community's heated indoor pool lets swimmers train year-round, though residents will also enjoy having an outdoor swimming pool that is open seasonally. Two lighted tennis courts and well-maintained walking trails also promote outdoor living, as does the beautiful 18-hole golf course, which was designed by Arnold Palmer and the Palmer Course Design Company. In addition to its fitness amenities, Regency at Dominion Valley's spacious clubhouse is a gathering place for many social activities. Residents can meet for a game in the billiards room, card rooms or other hobby rooms, while an arts and crafts room lets residents explore creative outlets. The clubhouse also contains the Jefferson Library, with its own cozy fireplace, and community computers that have high-speed Internet access. For residents' dining needs, Regency at Dominion Valley features two on-site restaurants: The Middleburg Grill, and The Regency Restaurant and Lounge. Regency at Dominion Valley's luxurious homes that include features that appeal to discerning buyers, including popular options like sunrooms, lofts, fireplaces, basements, and screened porches. The distinctive kitchens feature 42" cabinets, granite countertops and a lovely ceramic backsplash. There are three different collections of single-family homes available as resale-only within the community: The Middleburg Collection, The Potomac Collection, and The Georgetown Collection. The Middleburg Collection includes versatile homes that are available in four distinct models, known as the Prestwick, Turnberry, Tradition, and Bayhill. The Potomac Collection also features beautiful single-family homes in multiple styles. There are four models in this collection as well, which are known as the Corsica, San Remo, Monaco and St. Raphael. The Georgetown Collection features carriage-style attached homes. These one-story homes can be described as patio townhomes with a single-family feel. These affordable attached homes are a bit smaller than those in the other collections but have thoughtful designs, which maximize the living space. There are three floor plans available in this collection: the Milford, Glenhurst, and Winfield. The Greenbriar Collection offers condos with two to three bedrooms and two bathrooms. Homebuyers can select from five models that are situated in four-story buildings. Residents of Regency at Dominion Valley enjoy active resort-style living. With a large variety of amenities, social clubs, community activities, and two on-site restaurants, residents may find few reasons to venture beyond the community gates. Yet whether planning an on-site activity or an excursion within the surrounding community, a full-time activities director is available to assist residents in making their plans. While an active lifestyle is supported, Regency at Dominion Valley also provides many places to simply relax. Residents can curl up with a good book near the fireplace in the Jefferson Library, watch a movie in the multimedia center, or enjoy a concert or stage performance at the Regency Center for the Arts. Regency at Dominion Valley is situated in the heart of Prince William County, in the town of Haymarket. Residents enjoy scenic vistas of the Bull Run Mountains, as well as a prime location that places them between Washington D.C. and the breathtaking natural beauty of the Shenandoah Valley. The area offers plenty of attractions, from shopping and dining to cultural events or outdoor recreations. The activities director on staff at Regency at Dominion Valley can help residents plan excursions to plays, museums, historic sites, galleries and much more. World-class shopping and dining can be found at Tyson's Corner in McLean, or residents can opt for the quaint charm of Old Town Manassas or Historic Middleburg. Excellent healthcare is within easy reach at the Prince William Hospital Center, while the relatively close hospitals of Georgetown and George Washington Universities are renowned for their research and treatment facilities. Regency Club - 30,000 Sq. Ft. There are plenty of activities available in Regency at Dominion Valley. Here is a sample of some of the clubs, activities and classes offered here. These low-maintenance homes are situated in four-story buildings with seven buildings in total. Condos offer two to three bedrooms and two bathrooms. The Georgetown Collection features carriage-style attached homes. These one-story homes can be described as patio townhomes with a single-family feel. These affordable attached homes are a bit smaller than those in the other collections, but have thoughtful designs, which maximize the living space. There are three floor plans available in this collection: the Milford, Glenhurst and Winfield. The Potomac Collection features four single-family home models that offer between 1,760 and 2,410 square feet of living space. Most homes have two to three bedrooms, two to three bathrooms, and a two-car garage. The Middleberg Collection offered the largest single-family homes with 1,900 to 2,030 square feet of living space. These homes were built with two to four bedrooms, two to three bathrooms, and a two-car garage. This community is beautifully built. The streets are lined with trees, the landscaping is gorgeous, residents and clubhouse employees are welcoming and friendly. The clubhouse was recently redone and is very pretty and no longer looks outdated. We've lived here about 5 years. It has everything we wanted and the golf course is great. The clubhouse is starting to need some updates, especially the indoor pool. It you like very traditional decorations the clubhouse will appeal to you. Our home here has been great, no problems at all. There are lots of activities and we have nice neighbors. 55places.com is not affiliated with the developer(s) or homeowners association of Regency at Dominion Valley. The information you submit is distributed to a 55places.com Partner Agent, who is a licensed real estate agent. The information regarding Regency at Dominion Valley has not been verified or approved by the developer or homeowners association. Please verify all information prior to purchasing. 55places.com is not responsible for any errors regarding the information displayed on this website.